Learn scientific, proven-in-the-lab approaches for getting people to pay attention to, understand, remember and act on your messages at Catch Your Readers, our two-day persuasive-writing Master Class in Charleston, South Carolina, on April 10-11. 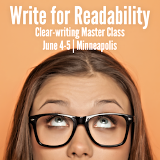 Grab attention, close the deal Master a four-part system for Catching Your Readers at our persuasive-writing Master Class on April 10-11 in Charleston, South Carolina. by Feb. 10 to receive a full refund, minus a 20% handling fee. by March 10 to receive a 75% refund. Sorry, no refunds after March 10.